If you enjoy the TBS comedy Are We There Yet?, then you’re in for a real treat. The cable channel has just renewed the sitcom for 90 episodes (no, that’s not a typo). Based on the 2005 Ice Cube movie, Are We There Yet? follows the newly blended Kingston-Persons family as they adjust to one another. The series stars Terry Crews, Essence Atkins, Teala Dunn, Coy Stewart, Christian Finnegan, and Keesha Sharp. Co-executive producer Ice Cube plays a recurring role as does former Family Matters star Telma Hopkins. This is the third TBS sitcom to receive such a massive pickup, following in the footsteps of Tyler Perry’s House of Payne and Meet the Browns. Are We There Yet? has been on the air for just 10 episodes but distributor Dembar-Mercury wants to take the series into syndication. TBS Orders 90 Additional Episodes of Hit Series ARE WE THERE YET? TBS has ordered an additional 90 episodes of the hit sitcom ARE WE THERE YET? following this summer’s highly successful 10-episode run. The series, which stars Terry Crews (Everybody Hates Chris) and Essence Atkins (Half and Half), is produced by Revolution Studios and Cube Vision and distributed by Debmar-Mercury. Revolution’s Joe Roth and Vince Totino and Cube Vision’s Ice Cube and Matt Alvarez serve as executive producers, along with award-winning show-runner Ali LeRoi. In addition to executive producing, Ice Cube plays a recurring guest starring role. In ARE WE THERE YET?, Crews and Atkins play Nick and Suzanne, a newly married couple whose blended family faces the challenges of everyday life. Teala Dunn and Coy Stewart co-star as Lindsey and Kevin, Nick and Suzanne’s 14 and 10-year-old children. Keesha Sharp (Why Did I Get Married Too?) is Suzanne’s best friend, who has a taste for men and the finer things in life. Comedian Christian Finnegan plays Nick’s best friend and owner of a sports memorabilia store. 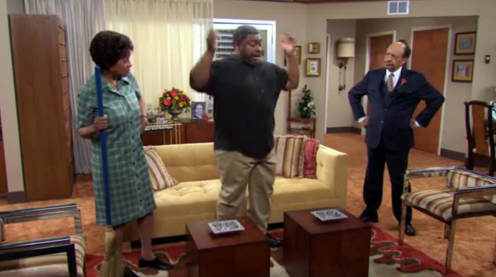 Ice Cube plays a recurring guest starring role as Suzanne’s brother. ARE WE THERE YET? premiered June 2 as part of TBS’s enormously popular Wednesday lineup of original sitcoms. The series went on to rank among ad-supported cable’s Top 10 new series for the quarter, averaging 2.8 million viewers and 1.5 million adults 18-49. ARE WE THERE YET? also scored as the #1 show on all of television in delivery of African-American adults 18-34 and 18-49 for the second quarter. Revolution Studios is the licensor and a distributor of the new series. Revolution Studios was founded in 2000 by Joe Roth, in partnership with Sony Pictures, Starz Encore Group and Fox Entertainment Group. Since its inception, Revolution Studios has created a library of 46 films, including Black Hawk Down, Maid in Manhattan, Anger Management and the Are We There Yet? franchise, collectively earning more than $3.7 billion at the box office. Currently, Revolution Studios is engaged in actively managing its library and pursuing licensing opportunities, including sequels, spin-offs and other productions based on its films. Prior to forming Revolution Studios, Joe Roth served as chairman of both the Walt Disney Studios and Twentieth Century Fox. In addition to being the majority owner of the Seattle Sounders FC, a major league soccer team, he recently produced Alice in Wonderland for Disney directed by Tim Burton and starring Johnny Depp. Cube Vision is a film and television production company that was started in 1998 by Ice Cube and Matt Alvarez. They have produced the successful Friday, Barbershop and Are We There Yet? franchises, as well as movies such as The Longshots and the upcoming Lottery Ticket. Additionally, they have produced the critically acclaimed television series Black/White. Other series include Barbershop: The Series and Friday: The Animated Series. Debmar-Mercury, a worldwide media company specializing in syndication, network, cable and ancillary markets, produces and distributes The Wendy Williams Show; distributes Tyler Perry’s House of Payne and spin-off Meet the Browns; distributes Big Lake, a new comedy debuting in 2010 from Gary Sanchez Productions’ Will Ferrell, Adam McKay and Chris Henchy; distributes Are We There Yet?, a new sitcom debuting in 2010 from Revolution Studios’ Joe Roth, Cube Vision’s Ice Cube and Matt Alvarez, and Show-Runner Ali LeRoi; distributes strips Family Feud, South Park and True Hollywood Story, as well as the weekly Deadliest Catch; and a movie library featuring titles from Revolution Studios and Lionsgate. Debmar-Mercury is a wholly owned subsidiary of Lionsgate (NYSE: LGF), the leading next-generation studio. TBS, a division of Turner Broadcasting System, Inc., is television’s top-rated comedy network and is available in 100.1 million households. It serves as home to such original comedy series as My Boys, Are We There Yet? and Tyler Perry’s House of Payne and Meet the Browns; the upcoming original comedy Glory Daze; the late-night hit Lopez Tonight, starring George Lopez, and the upcoming late-night series starring Conan O’Brien; hot contemporary comedies like Family Guy and The Office; specials like Funniest Commercials of the Year; special events, including star-studded comedy festivals in Chicago; blockbuster movies; hosted movie showcases; and championship sports. What do you think? Are you glad that Are We There Yet? has received such a big episode order? Do you like the show?